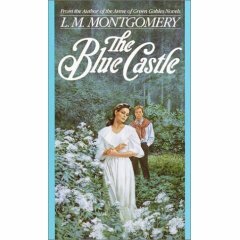 I just finished re-reading Montgomery's The Blue Castle. It's been a few years since I've picked up this book. Montgomery, as many of you are aware, is my favorite author. As far as I'm concerned, I will never find another series as captivating as her Anne of Green Gables. I continue to love the innocence and imagination of Anne. One of the most fabulous vacations I ever took was a trip to Prince Edward Island where I discovered that the Island that Montgomery wrote about was every bit as lovely as she had ever said. I own every L. M. Montgomery book that's been published. I keep hoping for the Undiscovered Manuscript. The Blue Castle is Montgomery-ish to its core. The way she describes nature in this book is in keeping with all her other writings. She seemed to love being out doors. Growing up in an area of the country that was perpetually hot, I always wondered what it would be like to actually WANT to go and explore the outdoors. I envied Montgomery's characters their freedom in being able to go outside without sweating to death. It was a little dream of mine to end up living some place where the temperature was cool enough to provoke one to open the windows and let the breeze blow through. Perhaps that's why I liked The Blue Castle as much as I did. The book's heroine is named Valancy Sterling. She grew up in a rather confining environment wherein she was not allowed to romp through forests and skate on frozen lakes. While my situation was due to geography, hers was due to a strict upbringing by a mother and various relatives who thought too much on illness as opposed to freedom and exploration. Valancy spends the first 29 years of her life wishing for adventure but being afraid to search for it. She is the assumed Old Maid of the family who is carefully guarded from disease and free thoughts. She lives in a rut and her life's excitement is wrapped up in nature novels that her aunt allowed her to read only because she thought they were more educational in nature. To Valancy the nature novels were poetry themselves and she longed to know what the author of the books was writing about. Valancy's real story begins when, believing herself to be as ill as relatives tell her, consults a non-family doctor regarding a heart condition. The doctor diagnoses her as having a fatal heart disease and advises her to take things as easy as possible. This prompts Valancy to reject family opinion and counsel and embark on a few adventures to see what life can be like when one is free to explore. Ultimately, Valancy's explorations leads her to the alter with one Barney Snaith, a reputed jail bird, according to local town gossip. For the first time in her life, Valancy knows what it's like to love - and be loved. She finds out what it's like to decorate one's own home in the manner which she chooses without having to submit all her decisions for some relative's final approval. She can trounce about in the woods, not wear a hat when it snows, cook food over an open fire, and wear her hair however she likes. She learns to love life. The book is really a Coming Out, so to speak, of a person who finally decided that they weren't going to wait for life to come to them. She was going to take life by the horns and wrestle from it an adventure or two. She was brave enough to set aside the opinions of others to do what she knew she needed to do in order to live. This book is unlike Montgomery's "lighter" writings, like Anne or Emily. The book doesn't focus on the growing-up struggles of a young girl, but instead a 29 year old believed to be set in her ways but whom everyone discovers has a vibrancy inside of her that was just waiting to be unleashed. The Blue Castle was just an enjoyable read for me the second time as it was years ago when I first picked it up. I'd highly recommend it. To be sure, its a "darker" work in some respects, but that's only because the characters are older and more mature. It's still Montgomery in essence. And that makes it enjoyable in and of itself. This reminds me…..Way back a few months ago I was going to post this and never got around to it. I read the Anne books numerous times when I was younger, but never bought the books for my own collection. So a few months ago I bid on and won an ebay auction of all the Anne books, plus about half a dozen or so of her other books (don’t remember exactly which ones without looking). And I got a great deal on them, too. I figured you’d appreciate me filling this gaping hole in my library. I’d love to have all her books. Do you know where I can find a list of them? Of the Anne books, I think my favorites were Anne of the Island/Anne of Windy Poplars and Rilla of Ingleside. I’m a sucker for Anne and Gilbert’s romance. And, surprisingly, Rilla turned out to be one of my favorite characters. I’d love to see your reviews of all her books. I was going to ask for a list of all L.M. Montgomery's books also. I'm here from semicolon. I read about "The Blue Castle" somewhere several months ago and when I went to read the reviews at Amazon I was amazed to see it has received 5 stars from 110 reviews!! I put it on my wish list and finally, last week, I had the money to order it. I can't wait to receive it but I'm not planning to read it until next year. Either last fall or winter I read a quote by a writer that recommended reading all the books of one particular author one after another and really immersing yourself in his/her thoughts. I did that this year with Jane Austen and next year I'll be doing that with L.M. Montgomery. I haven't read the Anne books in years so I plan to read them all again first and then dive into as many of Lucy Maud's books as I can find. So, your review of The Blue Castle really caught my eye. Can you post a list of all of her books you are aware of? Hey Joanna! Thanks for your comment. I've posted a list, as requested. Oh, I love this book, and all the LMM books and short story collections. I don't know if she is my absolute favorite authors (there are so many to choose from)...but she is on my reread list every year. The Blue Castle is one of my all time favorite books. Of course, most L.M. Montgomery books are on my all time favorite list of books. You wrote a lovely review for it! Nice review...don't know how I missed this one when you posted it before. MBC is my favorite of LMM's books for numerous reasons. And BS's nickname for her is so precious.